J. Christopher Howk, Nicolas Lehner and Grant Mathews of the Center for Astrophysics at the University of Notre Dame published a paper this week in the journal Nature titled “Observation of interstellar lithium in the low-metallicity Small Magellanic Cloud.” The astrophysicists have explored a discrepancy between the amount of lithium predicted by the standard models of elemental production during the Big Bang and the amount of lithium observed in the gas of the Small Magellanic Cloud, a galaxy near to our own. The team, using observations from European Southern Observatory’s Very Large Telescope (VLT) in Chile, measured the amount of lithium in the interstellar gas of the Small Magellanic Cloud, which has far fewer star-produced heavy elements than the Milky Way. In addition to the production of elements by fusion in the core of stars, scientists believe conditions immediately after the Big Bang led to the formation of some elements, including a small amount of lithium. Stars in the Milky Way have about four times less lithium on the surface than expected by Big Bang predictions. Some scientists suggest that stellar activity might destroy lithium, or the element might sink from the surface through lighter hydrogen, but the remarkably consistent ratio from star to star is a challenge to those explanations. Observations of gas in the Small Magellanic Cloud revealed the amount of lithium that predictions say would have been produced at the Big Bang, but leave no room for subsequent production of the element. One explanation could be a novel kind of physics operating at the Big Bang that left less lithium than the Standard Model predicts. 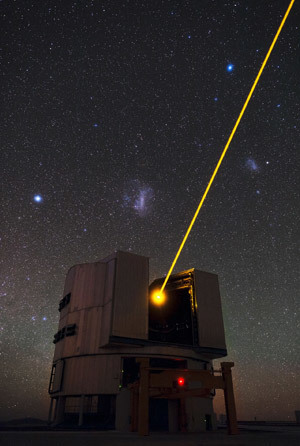 To pursue this possibility, the team will conduct three nights of observations on the VLT in November. They will look for the lithium isotope 7Li in the Large Magellanic Cloud and 6Li in both the Large Magellanic Cloud and the Small Magellanic Cloud. The standard model predicts that no 6Li was created at the Big Bang. Brian Fields of the University of Illinois at Urbana-Champaign co-authored the work. Originally published by Marissa Gebhard and Gene Stowe at newsinfo.nd.edu on September 07, 2012.